Moms have many challenges…one challenge that I’ve had is getting my children to eat vegetables. Many parents go through this phase. I believe it’s a phase, when they are young they eat everything they are given, even the vegetables, but as they grow…something happens. Is it that they hear others say no to healthy foods, there palate gets used to sweets, they’re too exposed to prepackaged foods through TV advertisements… anyway, it happens and they start not wanting to eat vegetables, or any other healthy food that is cooked at home. As parents we cannot stop cooking, offering and serving these delicious, crunchy, healthy vegetables. Our children look up to us and we are their example, especially in the way we eat and exercise. They will eventually see that we not only speak about healthy eating but we actually eat healthy. There are many adults, believe it or not, that do not like to eat vegetables, and usually their children don’t eat or like vegetable either. Now, as the kids grow they start tasting new foods. I have seen it with my children, they used to say no, no, and to avoid table tantrums, I did not force them to eat but always offered and served those veggies, patiently. Now my son loves kale, thanks also to the wonderful school he attends where they have a school garden where they harvest their own vegetables and prepare them in their nutrition class http://thegardenatoja.wordpress.com/ . I was also glad when my daughter started eating some salad. We have to be creative in the preparation and make them tasty and visually enjoyable. People do not consume the recommended portions of fruits and vegetables are recommended daily. Drinking smoothies can help us get more fruits and vegetables to nourish our body. Every opportunity counts…maybe its adding lettuce and tomato to a sandwich, or having a handful of baby carrots as a snack. Veggies are good anytime. All this got me thinking, and I had the idea of adding vegetables to all our meals. Of course the best way is to eat them with your meals, but for those picky eaters why not hide your veggies in the meal you are cooking. I have tried it and it is a success. 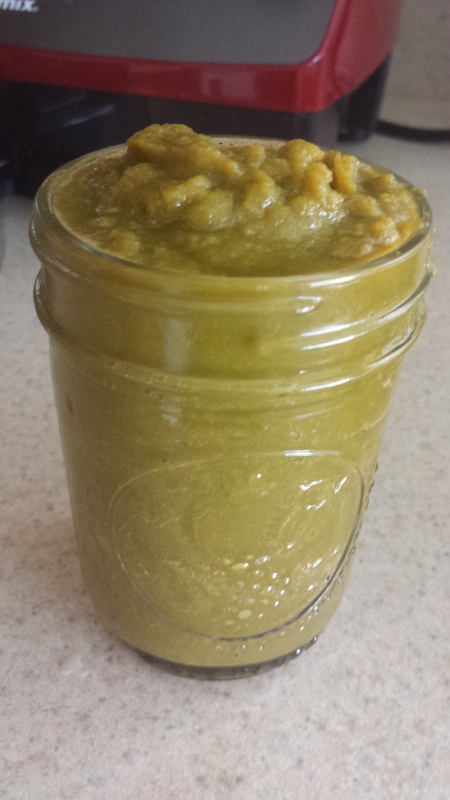 So simple… I blended a few veggies together with a small amount of water. 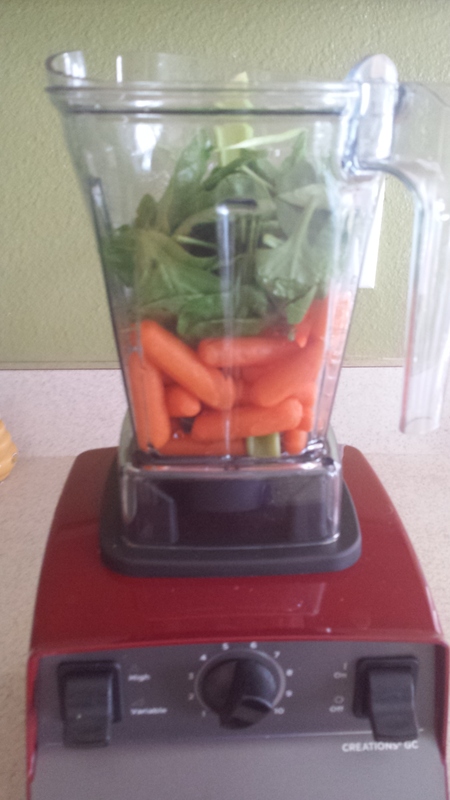 I blended baby carrots, celery, spinach and kale. This formed a vegetable paste which I added to my food when cooking. That yummy Latino food we cook, Puerto Rican whole wheat rice and beans…I just add my veggie paste with the sofrito and all the other ingredients and no one notices the difference. They are getting additional health benefits. No one at the table asked because there was no difference in the taste. You can add any vegetables you have in the fridge that day or plan to prepare a medley of different ones each week. Add them to your pasta sauce, and be creative. Any leftover paste can be refrigerated and used in the next 2-3 days to keep them fresh. 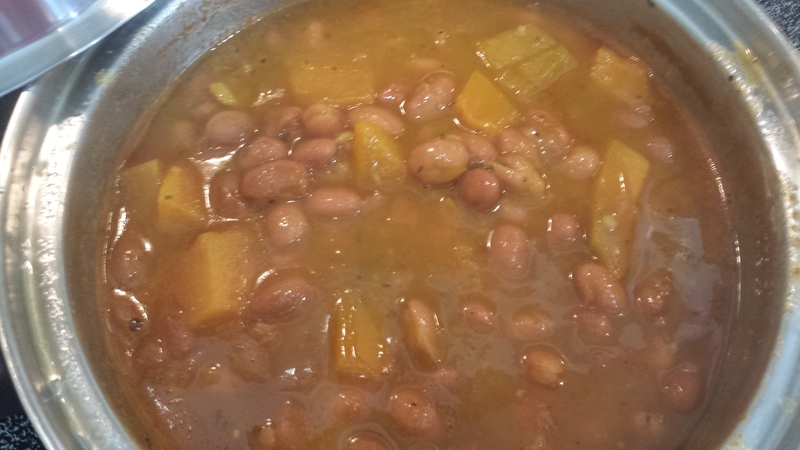 Delicious pink beans with hidden veggies and pieces of squash. Yum! 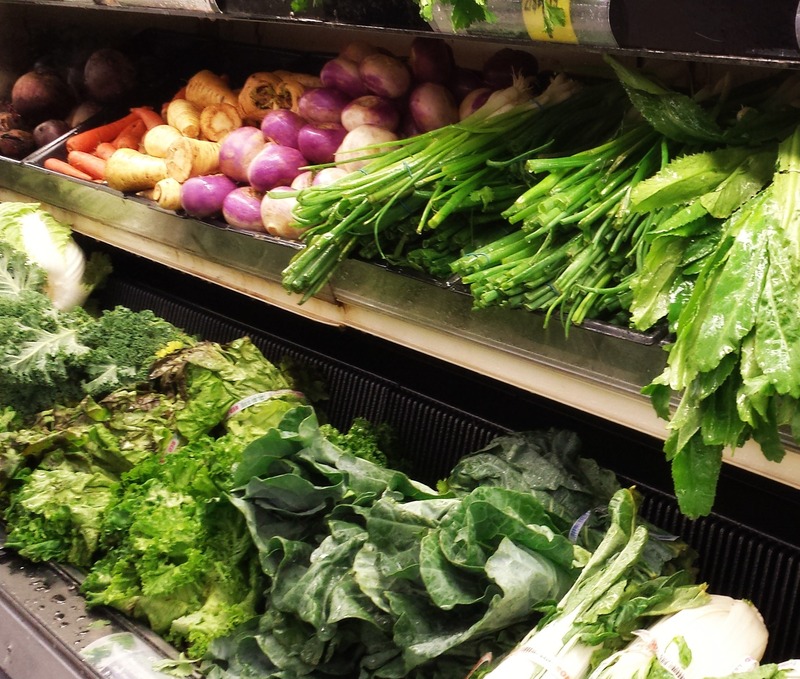 Have you hidden veggies before? Tell me more, and don’t let any picky eaters read this, they might not want to eat with my family if I invite them.